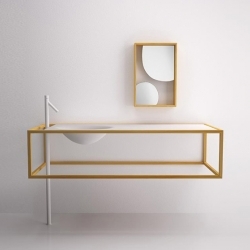 'Nendo Collection' bathroom furniture by Studio Nendo for Bisazza Bagno. 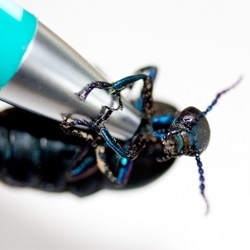 FEATUREDThe beautiful, highly iridescent, violet oil beetle. An incredible and fascinating creature with bumbling ways, tiny wings and an intriguing life history which includes hitchhiking on bees! 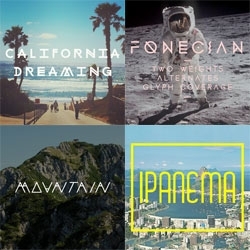 Ten Dollar Fonts is an international typography collaboration of young designers selling their fonts together. 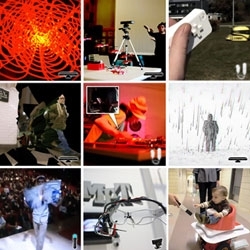 FEATUREDDumpster pinhole cameras, stupidity in super slow motion and adorable baby coatis are all part of this week’s roundup from NOTCOT.org. 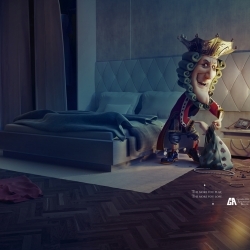 Kruysman and Proto create 'Synchronous Dissections'. 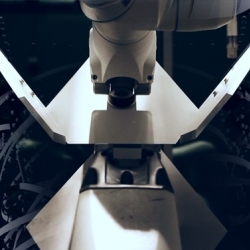 Assembling, reconfiguring, and disassembling of an object in space over time with 4 robots. 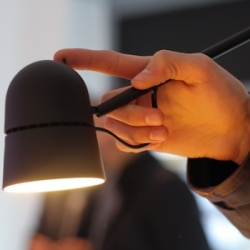 Wrappie Lamp, a functional and great design for your home! By Tomasz Pydo. 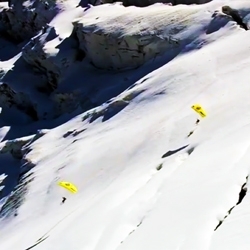 VIDEOSpeed Flying from the Mont Blanc summit to the base looks like an extraordinary experience. 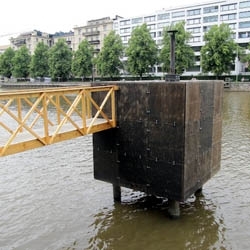 Hot Cube in the River, in the middle of the city, is a minimalistic 'sauna' made by sculptor Harri Markkula. The steam of the 'water-based' tarred wood sculpture is blissfully soft. 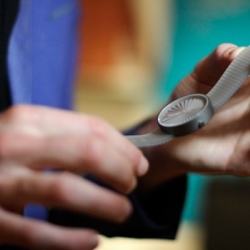 PLICATE, Benjamin Hubert's new 'timepiece' for Nava. 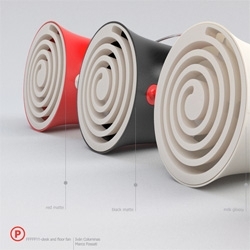 Designers: Ivan Colominas, Marco Fossati's fan: FFFFF!!! 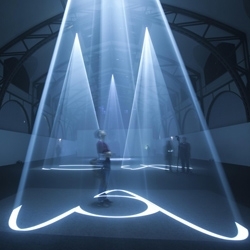 Anthony McCall's largest solo exhibit to date, 'Five Minutes of Pure Sculpture' at the Hamburger Bahnhof in Berlin now through mid-August. 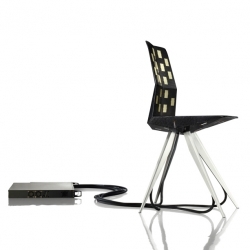 Reed Kram and Clemens Weisshaar created the lightweight R18 Ultra Chair for Audi. 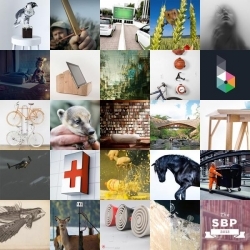 First beta showing to the public during Milan Design Week, the final result will be released in December at Miami Design. 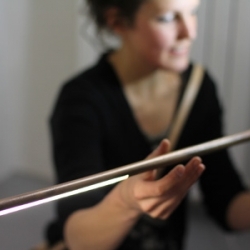 Balance Lamp | Mieke Meijer | The LED wooden lamp by Mieke Meijer at Salone for the exhibition ‘Untouchables Retouched’. 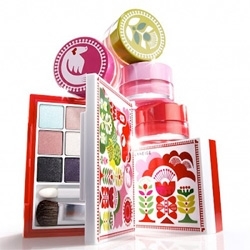 Lovely new work by Sanna Annukka for Korean makeup company Laneige. 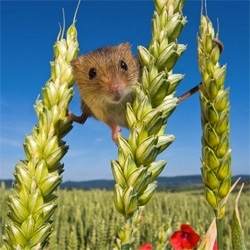 Fantastic photos of tiny harvest mice by Jean-Louis Klein and Marie-Luce Hubert. 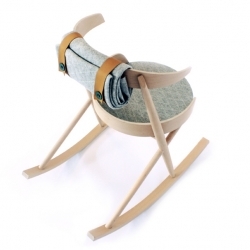 Hummingbird is a contemporary take on a classic rocking chair by Dana Cannam Design in collaboration with Studio Agata Karolina. Through an ergonomic study of office seating and traditional rockers, Hummingbird facilitates both work and relaxation. 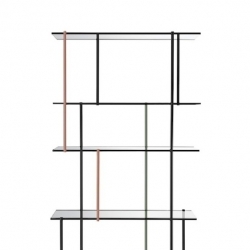 'Drizzle' shelving system by Luca Nichetto for Gallotti & Radice. Altdeutsche möbel for Moooi by Studio Job. 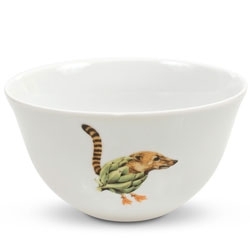 VIDEOPinguim Rei, adorable set of tableware from Holaria. 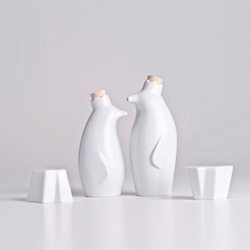 The penguins hold oil and vinegar and their iceberg are salt and pepper shakers. 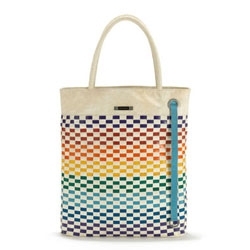 Newest Freitag Reference Limited Edition R515 is awesomely colorful and beach ready in 5 color palettes ~ my favorite is the WILLIAMS LETTEN! 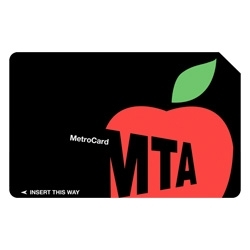 Melanie Chernock resdesigns the Metrocard. 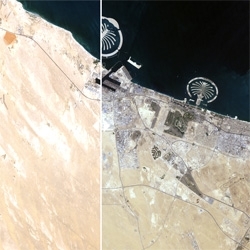 Incredible satellite images capturing urban sprawl and the spread of humanity. 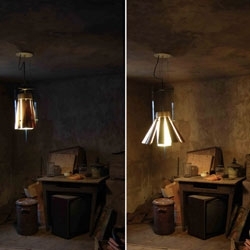 VIDEOThe Nothing Lamp by Francisco Gomez Paz for Luceplan. 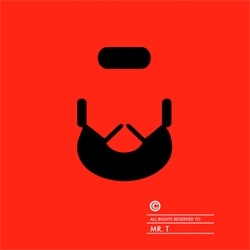 Iconic copyrighted famous hair poster series by Patrícia Póvoa,. 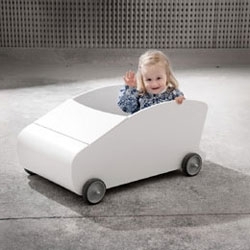 Pasila Design's Auto ~ The car is a multifunctional furniture, a toy, and a bed. Intended as a bed during the baby's first couple of months, as the baby can be rocked to sleep in the wheel-fitted car. 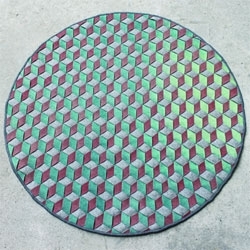 Siren Elise Wilhelmsen's Season Carpet serves as a "soft thermometer" ~ The carpet is braided in a three-color pattern, where each color has a different temperature sensibility and will change its color at different temperatures. 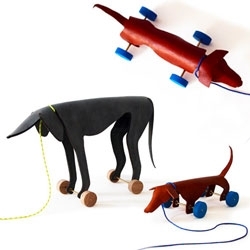 Ellen Heilmann's adorable WALDI UND SPRINTER - Dog Pull Toys for children made out of leather in collaboration with Kathrin Schumacher. Catherine Werdel's Eclipse light - Eclipse is formed by two glass cylinders, wood slats and a metal construction. The higher you place the internal cylinder the less light you get. 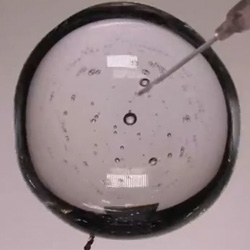 SmartInversion is a helium-filled flying object that moves through the air by turning inside-out. 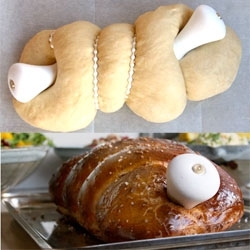 Tal Zur's self slicing Hallah Handles... a Silicone and ceramic device that you bake in then slices the bread when you pull the handles! 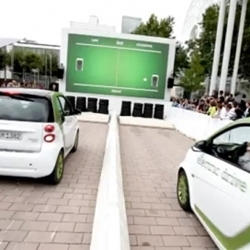 VIDEOSmart EBALL, using smart cars as controllers to play pong! 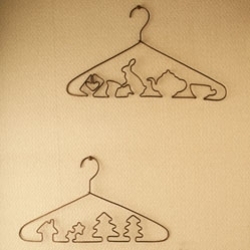 Bart De Keyzer - A sneak preview of an upcoming alphabet/animal project. 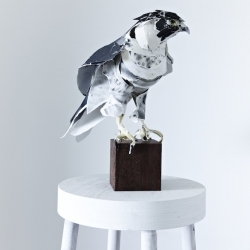 Steely-eyed peregrine falcon, a recent addition to the paper menagerie of Anna-Wili Highfield, as seen in Afar magazine. Amazing knocking 'doorbell' from Bobby Petersen. 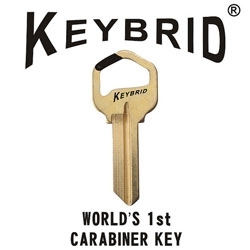 Watch the video to see how it works. 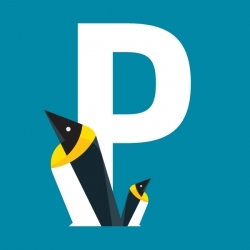 Superfly - a new way to search flights! 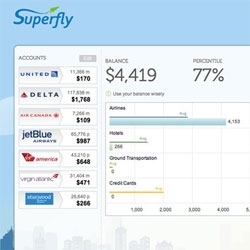 Superfly helps you organize your miles, and provides a Kayak-like search engine to help you find the best flight given your frequent flyer memberships. 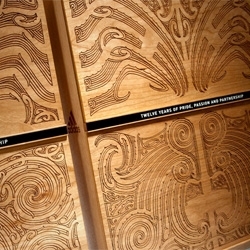 Beautiful packaging from The Art Box Collection & Paperlux for a gift to the players and partners of of the All Blacks Rugby team, commissioned by Adidas. 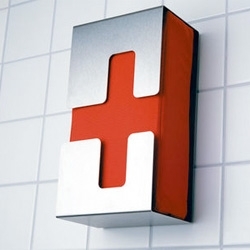 Gorgeous first aid box from Radius Design. 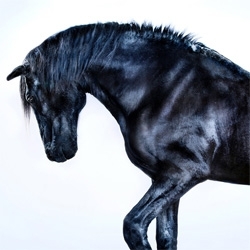 'All the Wild Horses', beautiful series by Andrew McGibbon. 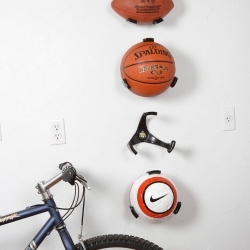 The Ball Claw holder is a quick and easy way to organize sport balls in any garage, basement, or child's bedroom. 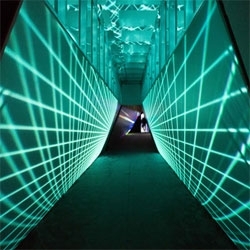 FEATUREDThis glowing tunnel is a digital light show leads into Ben Jones' video installation at the Avant/Garde Diaries Transmission LA: A/V Club at MoCA. 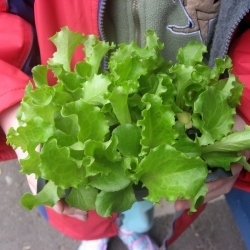 School-Garden-to-Zoo: A completely unique Garden-to-Table program involving students raising food for zoo animals and in turn becoming hooked on the food themselves. FEATUREDAra Peterson & Jim Drain created a mind trip of household fan driven pinwheels which are dizzying and fascinating to walk through at Avant/Garde Diaries Transmission LA: A/V Club at MoCA. See them spinning for the full effect. 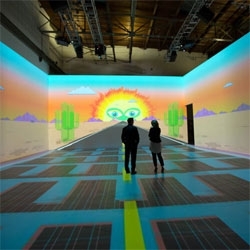 FEATUREDYou have to see it moving - Ben Jones' installation at Avant/Garde Diaries: Transmission LA: A/V Club is a trip. It's like being sucked into an 8-bit racing game of a room... hard to walk around in! 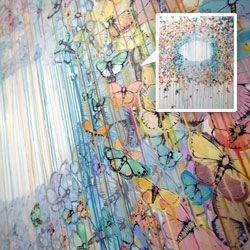 FEATUREDSage Vaughn's moth filled drippy paintings seen at Avant/Garde Diaries Transmission LA: A/V Club at MOCA. 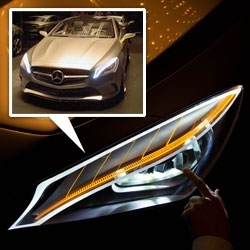 FEATUREDMike D of the Beastie Boys made a handful of Mercedes-Benz Emblem necklaces ~ a few as tall as you ~ and a few life size necklaces for artists and Mercedes folks at the Avant/Garde Diaries opening last night. 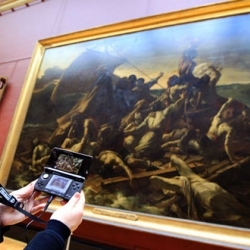 Visit The Louvre and you can use a Nintendo 3DS to access an exclusive audio-visual tour. In lively and informal on-the-spot interviews, the museum’s curators and lecturers share their expert knowledge of the Louvre and its artworks. 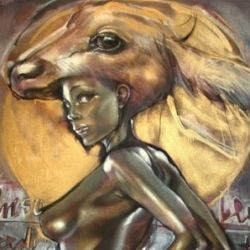 Herakut‘s new solo show 'Loving the Exiled' opens 21 April at 941 Geary gallery in San Francisco and we’ve rounded up a few great shots of the amazing German artistic duo painting in preparation. 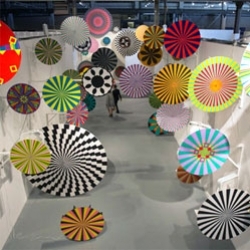 'Seventy plays with Seletti': a window+store installation designed by BBMDS using dozens of 'a la carte' modules during the Milan Design Week 2012. 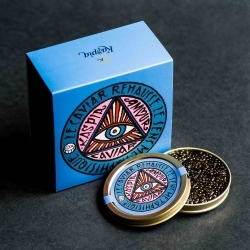 Caviar Kaspia commissioned graffiti artist Andre Saraiva to create a colorful limited edition box label inspired by the look of a magic box to 'access to a world beyond reality'. 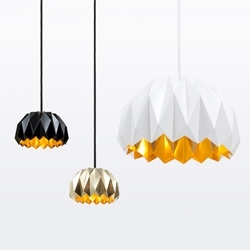 'Ori' hanging light inspirated by origami art by Lukas Dahlén. 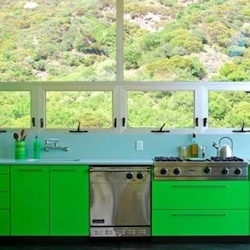 In this Los Angeles kitchen designed by Bruce Bolander, acid green cabinets complement a pale blue backsplash. 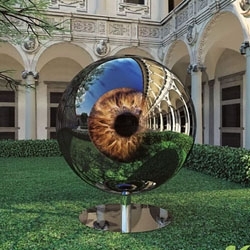 'The Architect's Eye' is a high-tech sculpture by Moscow-based architects SPEECH Tchoban & Kuznetsov with changing iris and pupil as well as images of abandoned Russian monuments. 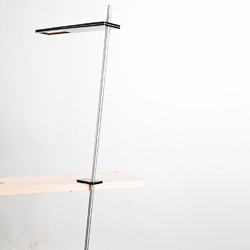 Balance OLED concept by Tore Bleuzé. 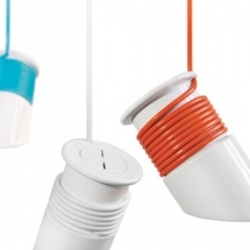 Balancing on the edge of the table the luminaire draws attention due to its optical illusion. 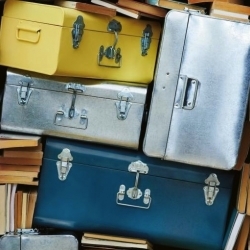 These zinc and iron storage trunks from Toast make tiny closets seem a little more bearable. 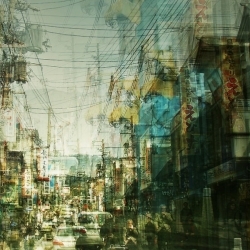 Experimental cityscape photography by Stephanie Jung. 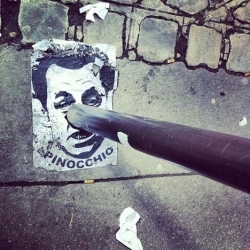 Succomber à l’impact (yield to the impact) by Eric Sauvé. 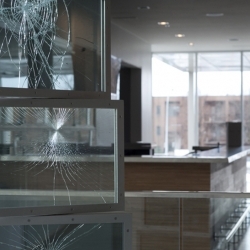 The shattered surfaces of this sculpture are suspended in a theatre lobby-- the actualization of drama and passion observed on the stage in a static form. 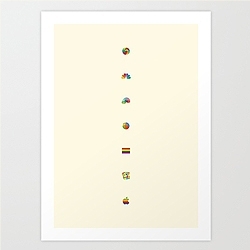 After Famous Clouds comes another gorgeous print by Yoni Alter, Famous Rainbows. 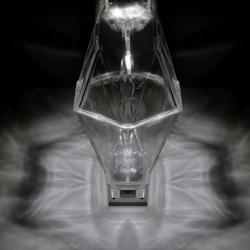 With a focus on creating prismatic crystalline faces and volumes that trap and amplify light reflections, CAI Light’s latest collection continues the company’s tradition of bold, forward-thinking design. 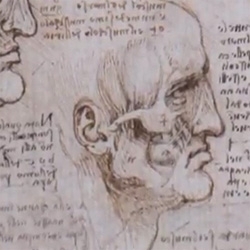 VIDEONature gets a look at the anatomical drawings of Leonardo Da Vinci at Windsor Castle. 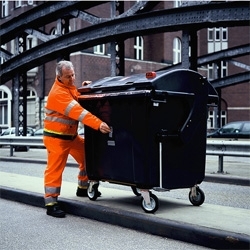 The Trashcam Project, a pinhole camera in a trash can! VIDEOBody Mechanics: tripped-out kaleidoscopic break dancing sequences featuring Benzo. Music by Grayson Matthews. Directed by Sammy Rawal of The Public Assembly. 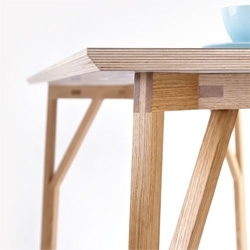 The DT1-Table by AS3D (Alexander Smith 3D Design). Frei Sebastião House is minimal home located in Portugal, and designed by AFR. 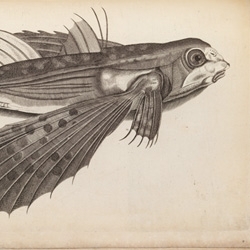 The stunning 'History of fishes', illustrations from Francis Willughby's De historia piscium, 1686. One of many gems from the picture library of The Royal Society. 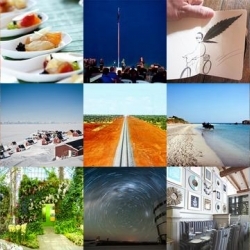 FEATUREDCamel racing, the Paranal observatory, and the remote Ittoqqortoormiit, Greenland are all part of this week’s travel roundup from NotVentures. 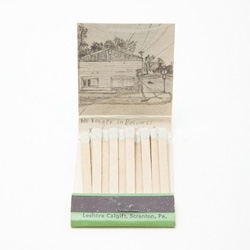 Matchbook artwork by Krista Charles. 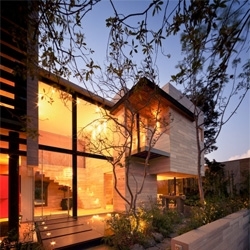 The Guanabanos House in Mexico designed by Taller Héctor Barroso. 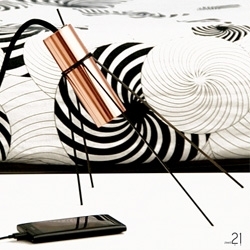 zwei21's Interioricity Lamp from Jasmin Kastner and Marc Joschko. 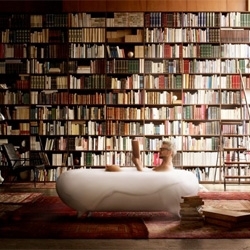 Gorgeous new bathtub from Kenya Hara for LIXII. 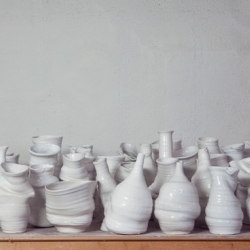 Some wonderful experimental vases by Berlin - Barcelona based ceramist studio Apparatu. 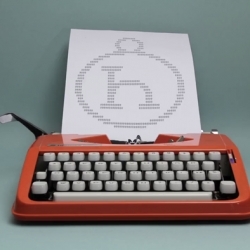 VIDEOMary Clerté & Edouard Bertrand created this new advertising campaign for Hermès to promote the new Petit H collection. 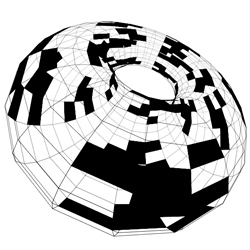 Life on a Torus by Moebio is a set of experiments for visualizing cellular automata in various ways. The results are fascinating, and be sure to draw a bit and hit play. 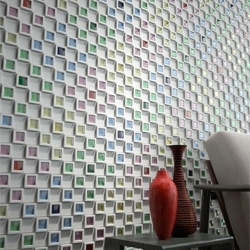 'Dent Cube' concrete tiles by Teruo Yasuda. 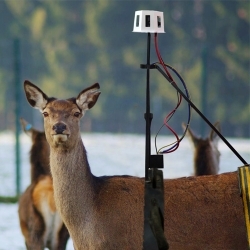 Forestview brings the capabilities of streetview in forests and natural places to explore beautiful nature from your living room. 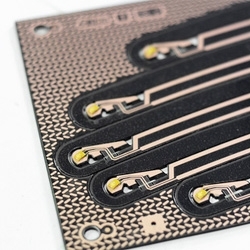 Part of a hoax project in the design interactions programme at the RCA by Philipp Ronnenberg. 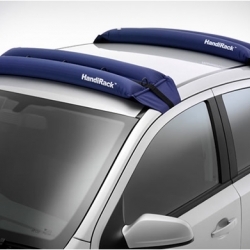 Simply remove the HandiRack from your trunk, give it a few quick pumps from the included double-action Handi Pump, and fit it onto your vehicle to carry loads up to 180 lbs. 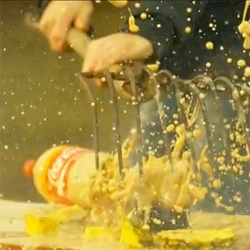 VIDEOSuper Slow Motion of Stupid and Dangerous Things, highlights from Danish TV show 'Dumt & Farligt'. 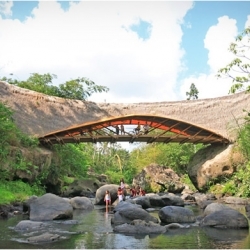 Ibuku Architecture is committed to the development of bamboo as a sustainable building material. Using only bamboo, they have constructed these incredible buildings for the renowned green school. Adrian Candela's Nit is a cardboard nightstand or side table that gives a second life and purpose to the boxes that originally held your furniture. 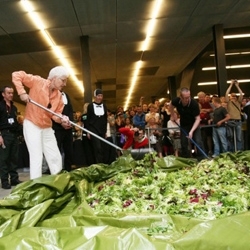 Fluxus artist Alison Knowles will be re-staging her 'Make a Salad' piece on the NYC High Line this Sunday, April 22nd. 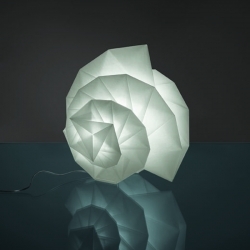 Artemide is continuing its research into light with a new collaboration: Issey Miyake’s Miyake Design Studio. 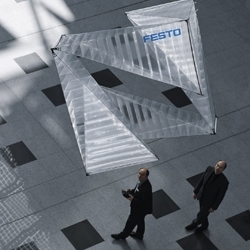 The exquisite IN-EI: a play on light obtained by folding and unfolding a sheet of recycled material. 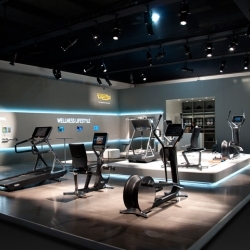 BBMDS designs the new Technogym booth at Salone del Mobile in Milan. A landscape made of wood and Corian where one can discover the 'Wellness lifestyle' concept. 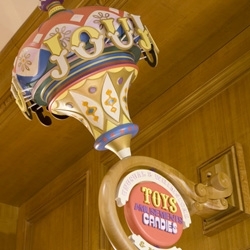 Fantastic branding and retail environment by Struck for JouJou: A Curious Boutique for Toys and Treats in Salt Lake City, UT at The Grand America hotel. 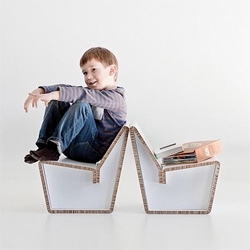 The Kenno children’s chair is the result of experimentation with a new kind of recycled cardboard designed by Heikki Ruoh for Showroom Finland. The Fog is a 46,000 sq. ft. environmental installation created from 16 miles of reclaimed cotton fabric and twine that visually illustrates the cycles of nature. 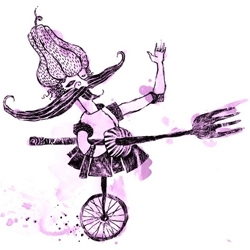 Created by The Experience Collective. 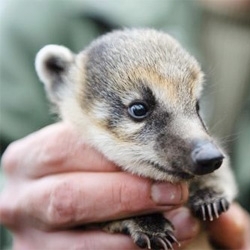 Adorable baby red coatis at Zoo Brno in the Czech Republic. 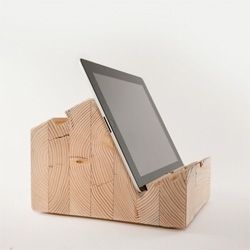 BLÖCT's plinth-like tablet stands carved from fir glulam beams. 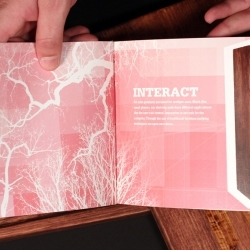 The Cube brand book is based on a conceptual identity investigation, with an emphasis placed on color and craft. By Brandon Boston. 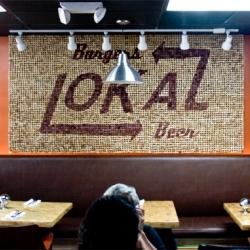 Take a look at the branding + typography from 6,950 wine corks, plus the identity and art created for LoKal, neighborhood burger and beer joint located in bohemian Coconut Grove, Florida. 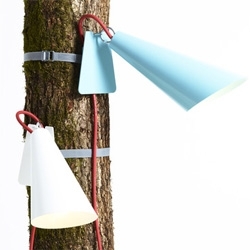 Pit Out outdoor lamp from e27 for Domus-Licht. FEATUREDAbsolut Greyhound ~ to celebrate the gorgeous new music + video (first of three!) 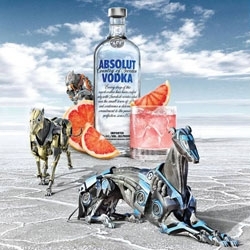 inspired by a drink ~ Absolut threw a Swedish House Mafia show in LA. See the beautiful venue, video, making of, and a peek at the show!